The most remarkable aspect of the new home of Brazeau Seller Law might be something you don’t see at all: the conventional jewel-toned reference books, a backdrop of every television legal drama. 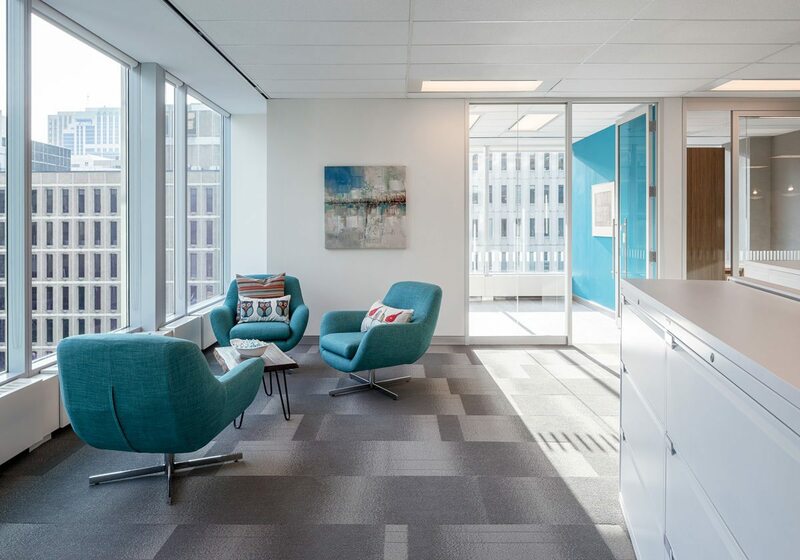 The firm moved into their Queen Street offices about a year ago. They needed more space, but they also needed an update. In their old office, they were drowning in paper and dusty books and were cordoned off from one another by cubicle walls. The transition to a near-paperless filing system has been tough, but they’re not looking back. “But we still have to carry a lot of paper around with us, we still need an enclosed space for confidential phone conversations,” explains Fraser. “And there’s a synergy that we benefit from when we’re all here working together.” Plus, some clients like to drop in, and they expect the person handling their file to be there. With these needs in mind, Fraser worked with Liz Miller of interior design company Parallel 45 to create a modern, light-filled space. 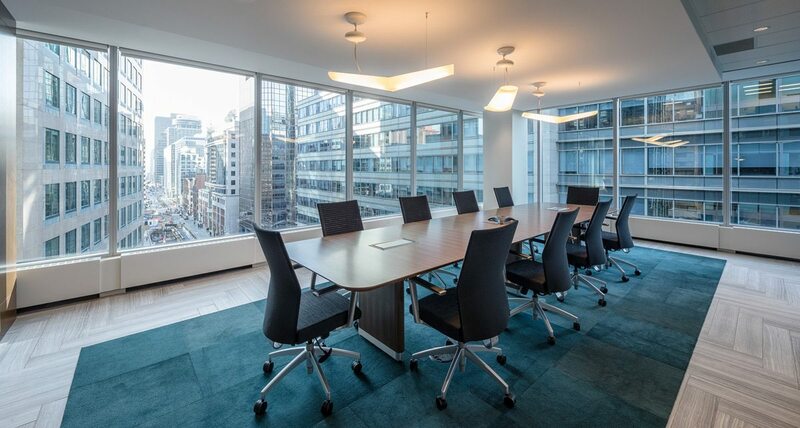 They started by choosing the location of the main boardroom — on the northwest corner, to offer a view to the vibrant streetscape of Queen Street. 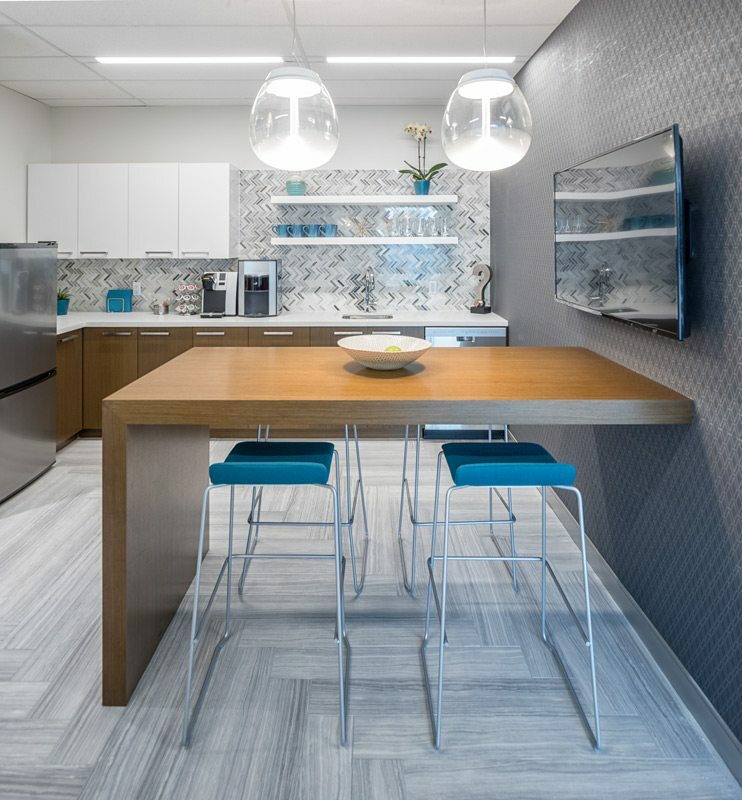 To further the synergy that comes with having people working side by side, Miller and Fraser crafted the floor plan carefully, placing people close to those they work with most. Dividing walls are glass with the minimum amount of marking, which makes everyone feel as though they have a great view. While some staff were initially surprised at the transparent walls, the overall effect has been magical. Having a good-sized kitchen was also important. Now, when food is brought in or a birthday is being celebrated, everyone has a place at the table. And desk-side mini fridges have been banned in order to encourage people to mingle, wind down, and feel at home. For Fraser, who acted as the liaison between her staff and Parallel 45, the process made her realize the importance of really listening to what her staff wanted. 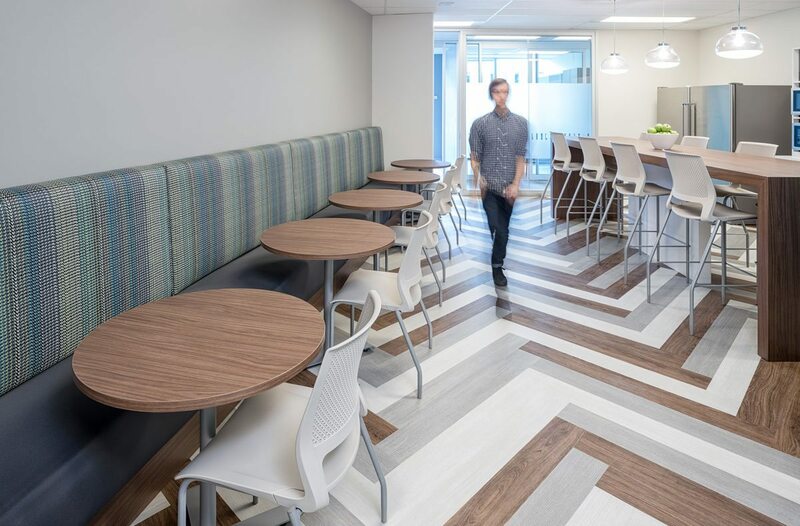 The room that holds office supplies and printers is a thing of beauty — the legal world is still very much tied to paper, but Brazeau Seller are one step ahead because their staff are not breaking their backs putting files together. And more importantly, their own voices are being heard.